If you’ve lived in your house a while and haven’t opened the walls for renovations, there’s a chance you may not know what kind of wiring lays behind them. While copper wiring has become the more widely used conductor for electricity within homes, many older homes still have original aluminium wiring, and this can certainly pose a problem. 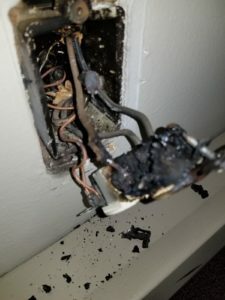 Aluminium wiring is more susceptible to overheating and can be a significant fire hazard and a more dangerous one at that, as electrical fires are often more destructive and surprising than other types of fires, as they tend to be difficult to identify. 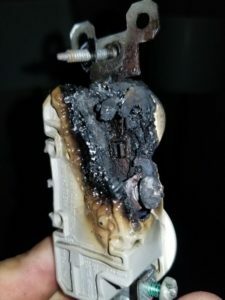 Two common signs of failing aluminium wire connections that you can be on the lookout for however, are flickering lights and browning of receptacles. These pictures are from a job we did recently; this customer was extremely lucky that the fire caused by the aluminium wiring did not cause further damage to their home. If you do have aluminium wiring in your home, please give us a call to ensure that the connections have been redone with proper connectors and that it is safe. If you’re unsure as to what type of wiring you have, but have seen either of these warning signs, contact us right away – let us help you keep you and your loved ones safe.